-What’s your name? : Andrés Díaz Caloca, but everyone calls me Niki. -What are your sponsors? 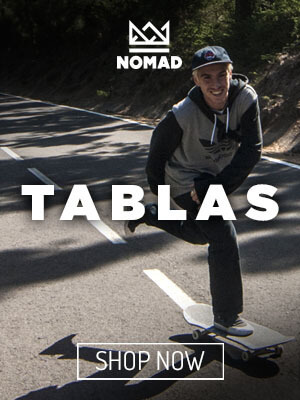 : Nomad Skateboards, AJ Project Skateshop, Lakai, Nowdist, Popcorn Hardware. -How many years have you been skating? : 12 years. -What is your favorite trick? : Kickflip. -Do you have a favorite Skater? : David Fernandez. -Which is your favorite spot? : Corte Never dies – (El Corte Inglés – Sta, Cruz de Tenerife). -Do you have a favorite Skatepark? : The street is an infinite skatepark. -Do you have a favorite city? : Barcelona. -What music do you usually listen to ? : Old School Rap. -What do you prefer Blondes or Brunettes? : Blondes hahaha. -When you are not skating, what do you do? : Studying or going around with the motorcycle haha. -What is your current setup? : Nomad medium steep kick 8”, Thunder 144 trucks, Nomad 52 wheels, Nomad Speedies bearings, Popcorn bolts. Visit our online Skateboard shop. 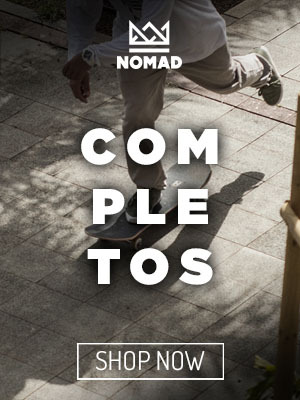 Nomad Skateboards.